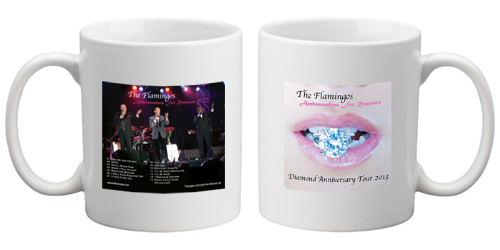 The Diamond Anniversary CD celebrates the 60th year since The Flamingos' first recording in 1953. Todays Flamingos use a modern, fresh and progressive approach to these great songs from the American songbook. 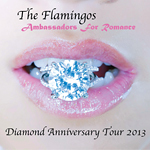 This CD will take your mind and your heart on a romantic musical journey, and will re-confirm to your ears that The Flamingos are still and will always be "The Ambassadors for Romance." 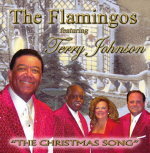 Terry Johnson - Rock & Roll Hall of Fame Inductee, Grammy Award Hall of Fame Inductee, BMI Award winner, R&B Foundation Pioneer Award recipient, former Motown artist/composer/producer - but above all, the vocal and musical arranger, first tenor and oft-lead singer of one of the greatest vocal groups in the history of Ameircan music, The Flamingos. Not content to simply rest comfortably in his rightful place as a revered music pioneer, his inspired soul continues to create, raise the bar and set a new standard. With the release of "The Christmas Song," Terry Johnson breathes new life into an old standard - once again showing the world how a sound can all at once be fresh & hip yet classic & refined. 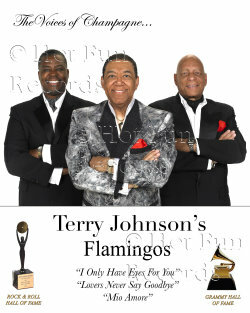 Terry Johnson is "STILL IN THE PINK"! 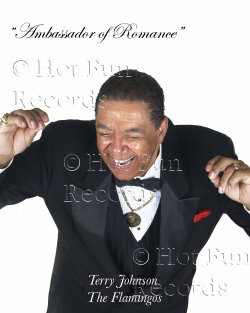 "Let's Be Lovers" features Terry with his Hot Fun Records recording artists Jeff Calloway and TeeTee. The music is done in his inimitable style, and is for all generations. It leaves you wanting more." Twelve long-time favorites, designed for dancing, listening pleasure and dreaming when you're in a romantic mood, make up the "Flamingo Serenade". You'll like these gently-styled offering that tame the rocking beat with soft, tender solos and sweet harmonies. 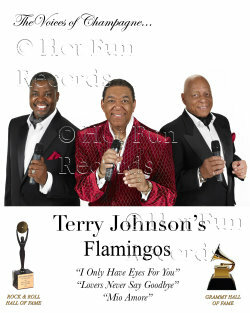 Place "Flamingo Favorites" on your turntable, flick the switch and be prepared to either relax or dance to one of the greatest singing groups in the music business today. Outstanding in this album is their rendition of "Besame Mucho." Encompassed herein is one of the most unusual arrangements of this old standard with the blending voices giving it a sound that could never be equalled. 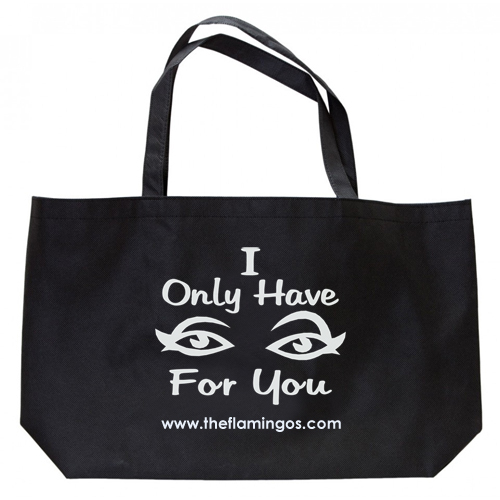 In short, you'll find in the grooves of Flamingo Favorites some of the really exciting things that can happen when human voices combine to interpret a song. 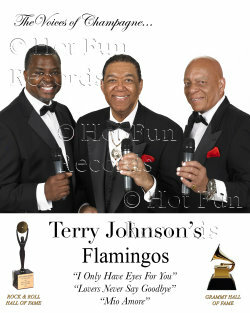 Tommy Hunt and Terry Johnson joined the Flamingos in 1956 as replacements for army bound Zeke Carey and John Carter. Newly reorganized, the Flamingos scored success throughout the East Coast and Canada. Their itinerary included stints at the "Rockin' Miami Beach Lounge", Pittsburgh's "Copa" and the "Club Chaudiere" in Hull, Ontario, and the "Beachcomber" in Wildwood, N.J. Zeke Carey returned from the service in August 1958. Versatility! If it were necessary to describe the key to the Flamingos' fabulous success in just one word, that word would be versatility. 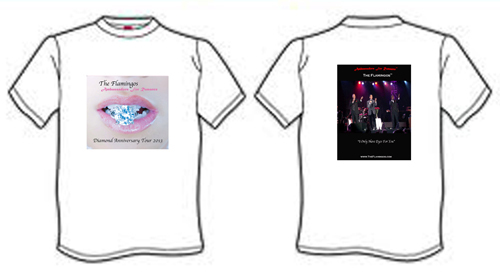 Their past performances, and those contained herein, more than aptly demonstrate their ability to wrap up a variety of tunes in ultra-commercial fashion. Now, sit back and relax or join in the fun as the crew weaves a magical ballad spell on this package marked especially for you, "Requestfully Yours." Featuring Terry Johnson, Theresa Trigg and Charles Sye.